Archeur Basilicon Lenement Zi 17 Take to ounces of beeswax to ounces of rosin to ounces of pitch to ounces of mutton suet to ounces an half fresh grease half an ounce of turpintine. Balsam 18 Take to ounces of bees wax to ounces of rosin one ounce of Burgundy pitch to ounces of mutton suet an to ounces of ye best oil. 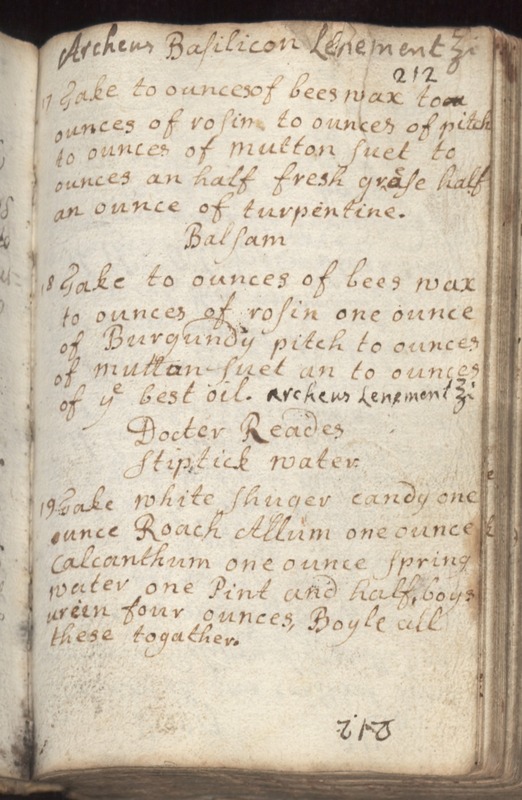 Archeus Lenement Zi Doctor Reades Stiptick water 19 Take white shuger candy one ounce Roach Allum one ounce Calcanthum one ounce Spring water one Pint and half boys ureen four ounces, Boyle all these togather.